Embracing positive change is the theme for the 11th annual Sun Valley Wellness Festival. In that regard, many of the speakers will represent a wide spectrum of alternative therapies. Experts in fields of movement, nutrition, spirituality and health will offer classes and lectures throughout the Memorial Day weekend in Sun Valley. The festival attracts at least 1,000 people to the valley each year to the various events. The event was initially produced by the Sun Valley-Ketchum Chamber & Visitors Bureau. 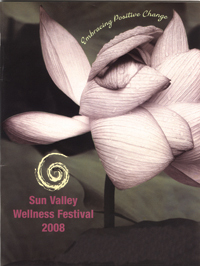 In 2005 it was reconfigured in as a nonprofit corporation, the Sun Valley Wellness Institute. Past keynote speakers include Robert F. Kennedy, Jr., Deepak Chopra, Ram Dass, Marianne Williamson, Byron Katie, Dr. Marasu Emoto, Mariel Hemingway and Debby Ford. This year, the keynote speaker is Dan Millman, author of "Way of the Peaceful Warrior" and seven other books. He will speak on Friday, May 23, at 7 p.m. in the Sun Valley Inn's Limelight Room. On Sunday, May 25, medical anthropologist Alberto Villoldo will speak in the Sun Valley Inn's Continental Room. Wellness Institute board President Cheryl Welch, owner of Chapter One Bookstore, helped organize the Sun Valley Wellness Festival 11 years ago to help bring spiritual opportunities to the community as well as to promote business in Ketchum over spring slack. She said it takes a full year to arrange the festival. "We start building around the people and authors we're interested in," she said. "It's a really hard-working board. "Having Alberto Villoldo come is really great. Everybody is interested in shamanism and he's the number-one guy. Today people are talking about taking care of the planet, shamanism and taking care of each other. We got (Macedonian faith healer) Konstanin Kajsarov through the Sun Valley Film Festival." This year the institute board wanted to increase the number of speakers who work in medicine. They found internationally known instructor in chi gong Lee Holden, former Olympic cyclist and chiropractor Jeff Spencer, and Dr. Mimi Guarneri, head of the Scripps Medical Centers for Integrative Health. She is sponsored by St. Luke's Wood River Medical Center. "It's really great to have the hospital on board for this," Welch said. Along with the many visiting speakers, Wood River Valley practitioners who will present include Dr. Andrea Girman and Mariel Hemingway, who will both speak on healthy living and share a workshop with spiritual guide Anamika. Workshops with local practitioners include Hatha yoga with Paula Child, Pilates with Margie Cooper, energetic gyrokenisis with Marian English and Elizabeth Clarke, Vinyasa yoga with Bard Widmer, NIA movement with Britta Von Tagen, Zumba dancing with Lory Rainey and Yin yoga with Mari Wania. On Saturday, May 25, from 2-3:20 p.m., Lama Tenzin, a frequent visitor and spiritual advisor in the valley, will present "Meditation in Daily Life and Healing Anger through Breathing Techniques." The Hands On Hall in the Sun Valley Lodge will offer dozens of products and services, too, from teas, herbs and skin-care products to gemstones, astrology, tarot and angel readings. For more information visit sunvalleywellness.org. · 1 to 4 p.m., workshops and presentations at Sun Valley Resort. Visit sunvalleywellness.org for times and locations. · 7 p.m., keynote speaker Dan Millman, Limelight Room, Sun Valley Inn. Tickets: $100 VIP, $40 general. · 8 a.m. to 6 p.m., workshops and presentations. · 9 a.m. to 5 p.m., Exhibit and Hands on Hall in Limelight Room, Sun Valley Inn. · 8-10 p.m., Sally Baldwin, "Communion with the Archangels," nexStage Theatre. · 9 a.m. to 5 p.m., Exhibit and Hands On Hall. · 8 to 9 p.m., Alberto Villoldo, "Courageous Dreaming," Continental Room, Sun Valley Inn. $35. · 8:30 a.m. to 5 p.m., workshops and presentations. · Tickets are available at Chapter One in Ketchum or sunvalleywellness.org. Students receive a 15 percent discount with a valid student ID.